Have you ever been to the opera? Did you like it? What did you see? Would you like to see more? As Elaine commented on her friend Jerry Seinfeld, who had never been to the opera before: "You know, it is so sad, all your knowledge of high culture comes from Bugs Bunny cartoons." Yup, that's me. Never been to the opera, probably never will..."Overture, curtains, lights..this is it, we'll hit the heights. And oh, what heights will hit! On with the show, this is it!" 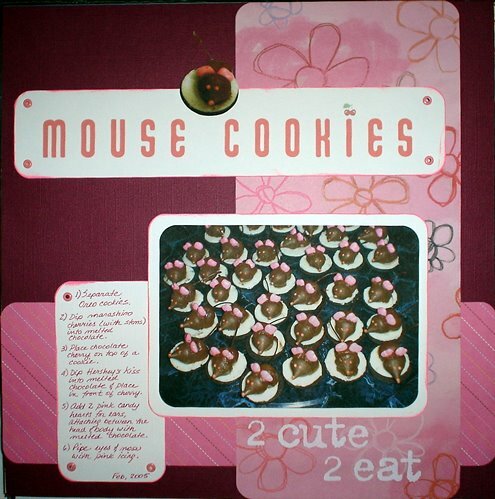 A few weeks ago, I was introduced to Crafttvweekly.com, a site with lots of instructional videos on scrapbooking, cardmaking, and other paper crafts. One of the projects was an origami tag holder, so I tried my hand at it. I finally finished the actual tags to go inside it; now that I have a Crop-A-Dile tool to set large eyelets and punch holes...what a great tool! Each tag has a photo of my "family"; daughter, hubby, two cats and our dog. I inked the edges of the tags and papers, attached a Prima flower to each and threaded some fibres through the eyelets. I also Xyron'd a ghost letter of each member's name and attached them on top of the tags. 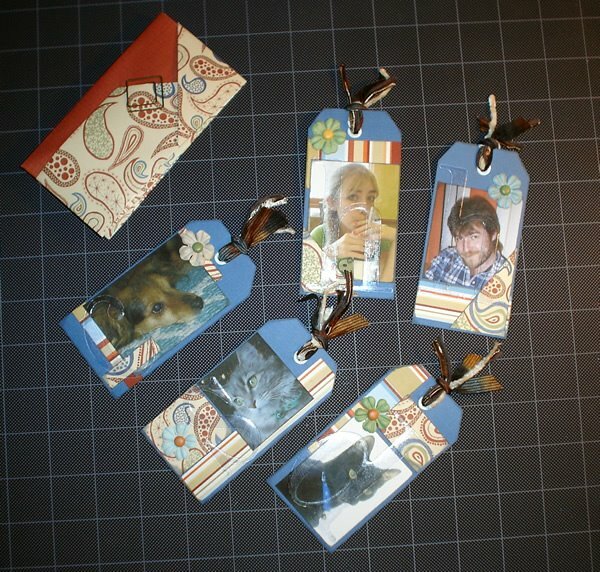 What a fun little project; and now I can carry my loved ones with me wherever I go! What is your favorite embellishment to use lately on your layouts? maybe buttons, flowers, brads? Eyelets! 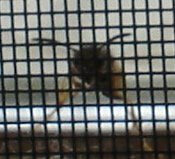 Now that I am having so much fun with my new Crop-A-Dile! It seems I get some of my best ideas in the middle of the night. 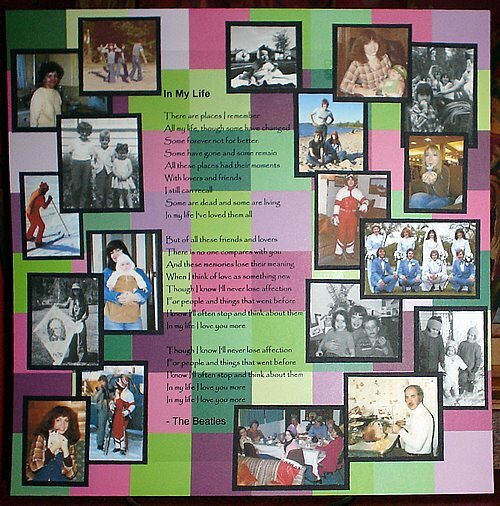 While listening to Beatles music late last evening, I came across one of my favorites; "In My Life"... it's a song I remember from the 60's when I was quite young. Just listening to it brings back wonderful memories of my childhood. So it was easy to build a page around the song (literally); I printed the lyrics on transparancy, and surrounded it with a collage of mini-photos of my family, friends and me from 1960 to 2006. Some are mounted on foam to raise them up and give the page some depth. The background paper is Junkitz "Hip Hop Squares". I was up till 1:30 am printing the photos so I could make the page at cropping night tonight. It's simple, but it doesn't need anything else. The LSS owner suggested I hang this one up to enjoy... I just may do that. For an interesting article on this song, go to BBC RAdio 2. Scrapbooking topic: How do you print your photos? What gives you the best results? Even had any really bad prints? Ever had a service lose your order/film? Non-Scrapbooking Topic: Tell us what you are good at. What do you excell at? Do you enjoy it? How did you get good at it? Do other people know you are good at this thing? Hmmm...okay, for the first question: I now print ALL my photos on my new Epson printer at home (which I got this past Christmas from hubby and daughter). It is wonderful! I can re-size and crop any of my digital photos and even add text right on them... then I print on white cardstock and I am all ready to crop! I used to use Walmart's Photo center. I think the money I've saved on developing has more than made up for the printer price... and it sure is less of a hassle to have the prints when I want them, instead of having to drive to the mall to pick them up. 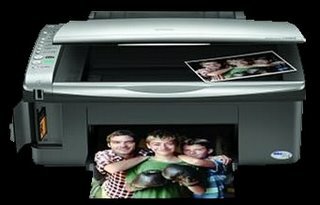 I also LOVE the way it lets me print beautiful LARGE photos...really dramatic! Now for the second question: What am I good at. Well, I love to draw or do anything artistic. 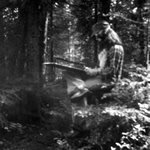 My dad taught me at a very early age how to paint. This blog is basically my venue to show what I have done, either in scrapbooking, painting, drawing, sculpting or in cross stitch. My artwork has also been on display in a few cities in the US when I spoke at conventions on sculpting. I am also good with computers, which I basically am self-taught in. (More on that on my other blog, Stale Coffee). Do others know about this? I guess so...I get paid to provide computer support at two local hospitals. 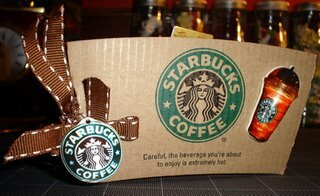 After watching Ana on Fiskar's.com do a demonstration on how to make a mini scrapbook out of a Starbucks sleeve, I wanted to try this myself. Daughter and I love our local Starbucks, so I filled my book with photos from our many visits. I made 6 pages in all, using Basic Grey paper (glued back to back and on the inside of the covers, front and back). Brown Bobbin ribbon holds the pages in place, three lengths holding each set of pages. The Starbucks logo "charm" hanging from the binding ribbon on the front is actually a photo I printed on Shrinky-Dink paper, cut out, punched a hole in it and I then shrunk it using my new embossing heat gun. I also set the colors on the piece with some Krylon spray. I also made a Shrinky-Dink of one of our favorite summer drinks, the Tangerine Juice Blend Frappachino and glued it to the front cover. A few fibers, clips and a self-adhesive tab at the top finished it off! Now I can carry my mini-book whereever I want! Inspired by a few artists at 2Peas in a Bucket scrapbooking, daughter and I each made our our "memo boards" from artists canvases I picked up at the Dollar Store. 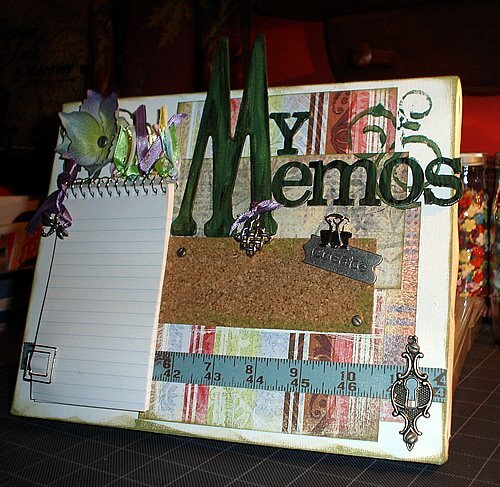 A few sheets of Basic Grey paper, corkboard, ribbon, a cheapo notepad, some silver embellishments, flower and chipboard letters was all it took to create my version. I inked the edges of the board and the papers, and used acrylic paint to stamp the canvas and paint the chipboard. Wow! Yesterday daughter and I spent nearly the whole day at our local scrapbook shop and we had a great time and got a lot done. I completed five layouts! This first one is about my making applesauce (see post below). The card on the right folds up or down, so you can see all the photos, or the transparancy behind (an image of all the apples beforehand). 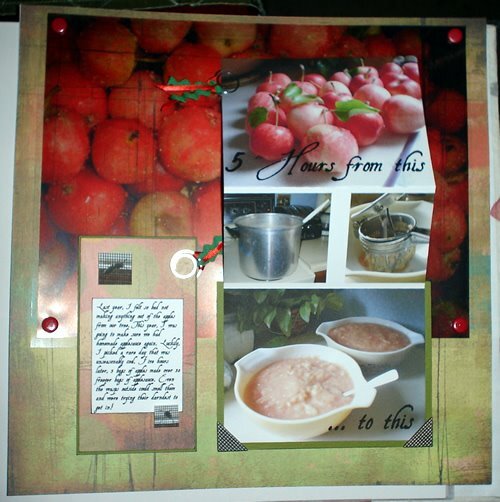 The journaling includes two small photos popped up with foam pop dots of the wasps that were trying to get in the kitchen while I was cooking up the sweet apples. Paper is Basic Grey. The third layout was of Dakotah's mug shot, caught red-handed (or pawed), in my dresser drawer. The paisley paper was a bit overwhelming as a solid background, so I cut it out and used it as a background frame. I also punched holes in the side and bottom (a bit hard to see here), used vellum for the journalling and embellished it with ribbon and a paisley heart charm. 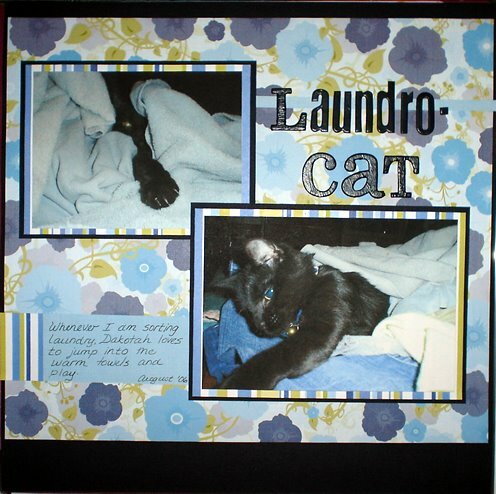 "Laundro-cat" (a play on the word laundro-mat) depicts Dakotah again in a playful mood. Whenever I do laundry, she jumps up on the bed while I'm sorting it and digs herself into the warm towels. A simple layout, but I like the way the colors came together. The last one I got done yesterday was "Profile of a Cat". 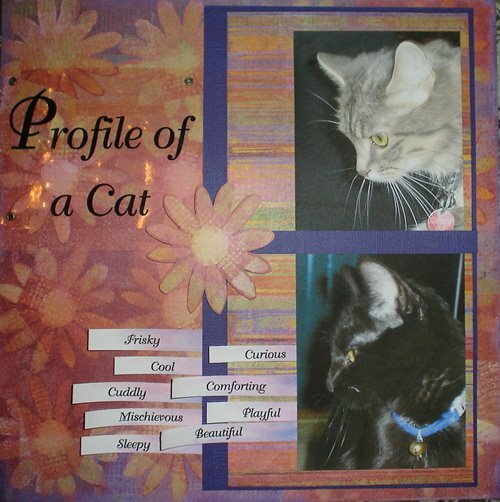 I had two cute profile shots of both our cats, Sheba and Dakotah, so I typed up some words that described them. I chalked and then sprayed a fixative on the words, cut them into strips and then adhered them onto the page. I also cut out one of the flowers from the background and popped it out using foam tape. Title is done on a transparancy held on with eyelets. I don't think I have ever done so many layouts in one sitting... daughter got five pages done as well, and we were beat after our marathon cropping session! 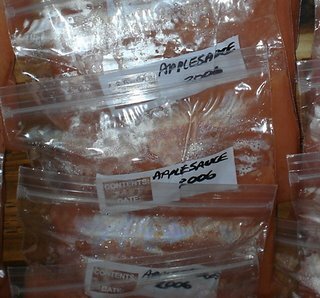 Creating isn't limited to stuff you look at; this weekend I spent five hours making applesauce, and I must say it is a work of art when it is done. 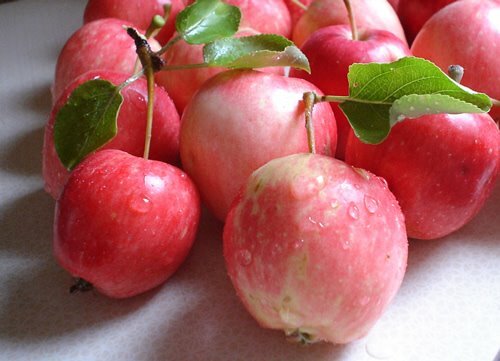 You see, we have a great apple-crab tree in our backyard. A cross between a true apple tree and a crabapple, the fruit is sweet and large. 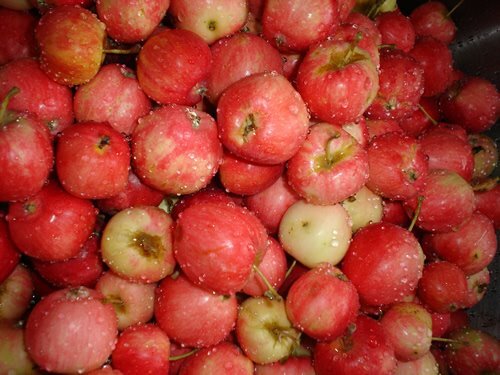 This year, because it has been so hot and dry, the apples are ready much earlier than normal. Luckily, I chose yesterday, a rare cool day to cook them up into sauce. Five hours later, three large bags of apples made over 30 freezer bags of pink sweet applesauce; no sugar added...and it sure is great to eat in the middle of winter with a nice pork roast! 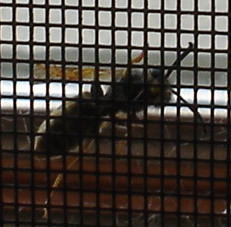 Even the wasps outside my kitchen window were attracted to the smell of the cooking apples! A HUGE thanks to Stephanie at Burnt Toast for two lovely cards I won in her blog's RAK! This is the first time I've ever received one (I have sent out one in the past)...and they are too nice to use. 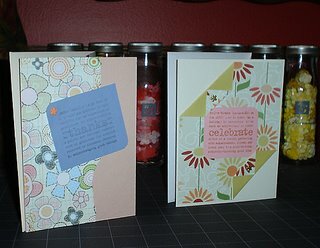 One is a Thank you card and the other is a Celebrate card! Such nice papers folded and pinned by cute brads we haven't seen up here in Canada before! 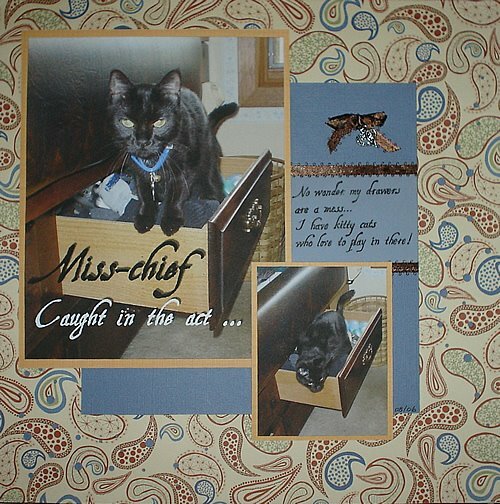 They now adorn my scrapbooking room -- thanks so, so much Stephanie!!!! Two more layouts were completed at our weekly croppin' session at Dalcrafts. The first one is actually of daughter's goofing while cropping; using chipboard letters to write me notes on the table, and choking on dinner she was laughing so hard...yes, yes, in true scrapbooker fashion, while she choked, I took pictures (she was fine, BTW). The second one is of our cat Sheba. 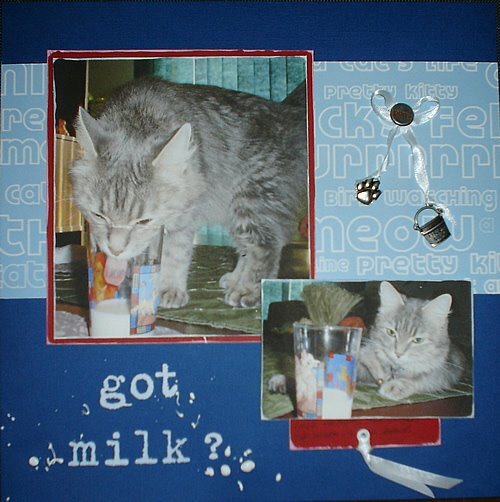 Inspiration for the photo came from catching the end of some "Funniest Animal Videos" show (or something like that) on TV... We saw this cat drinking milk from a glass by putting her paw into it and licking it off! It was so cute, we wanted to see if Sheba would do the same. She sometimes gets to lick our cereal bowls (after we are finished, of course), but this morning, I put some milk in a glass instead...just enough so she couldn't reach it by sticking her head in. No luck, though; she refused to get her paw wet, and instead tried desperately to stick her tongue as far as she could to get at the milk...hilarious to watch! Poor girl; I poured the milk out into a bowl after all. I used some great white ink to edge everything (making it "milky), and splattered white paint around the rub-ons title. 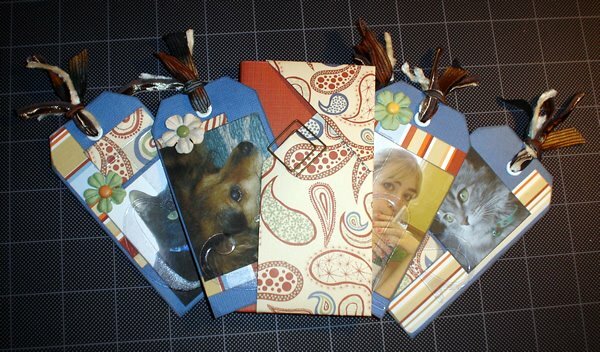 Hidden journalling is slid under the smaller photo. Charms include a "purr" round brad, a cat's paw and a milk bucket on the white ribbon.